After wowing audiences all over Europe, Amelie, the story about a young woman on a quest to make things better for the people around here, arrives here on domestic shores. The film's straight moral compass and overreaching sense of whimsy and fantasy are what draws audiences to it. It is a nice escape from both other movies and events in the real world. This is the latest film from Jean-Pierre Jeunet (Alien Resurrection, The City of Lost Children), who always manages to make each film of his look distinctly unique. Here, Paris looks warm, inviting and welcome, matching to tones of Audrey Tautou (Venus Beauty Institute, The Libertine), who plays the title character. Amelie is a shy young woman, who frequently delves into the world of fantasy. 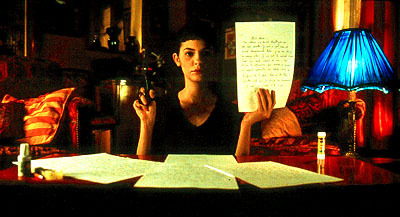 In fact, Amelie plays in a way like a fairy tale complete with narrator (Andre Dussollier, A Crime in Paradise, Ouch). Amelie discovers forgotten box in her bathroom. It contains the childhood mementos of a small boy who lived in her apartment years ago. She vows to find the owner and return the box, and if he reacts positively, she will keep doing things to help people. The man tears over with joy, and a new hero is born. She looks at the people around her and decides that she will be the person to make their lives better. Amelie concocts a plan to set up two lonely people, help an elderly painter who lives in her apartment, and help her father emerge from the cocoon he built around himself after the death of Amelie's mother. Along the way, she also has time to help a blind man across the street while describing to him the unseen world around him, and to fall in love with Nino (Mathieu Kassovitz, Jakob the Liar, Pleasure), another dreamer. Nino collects torn photographs found underneath picture booths and reassembles them. Amelie fancies herself as Zorro (in some amusing black and white sequences), which is a fitting description. One of her main projects is to wreak revenge on Collignon (Urbain Cancelier, On Guard, Riches, Belles, Etc. ), the local grocer. He mercilessly mocks his assistant Lucien (Jamel Debbouze, Granturismo, Bricol' Girls). She steals the key to his apartment and does little things to make his life miserable. This is the only distasteful element of Amelie because it is so mean-spirited. All of Amelie's actions, including this one, are to make others feel better. This one is different because it comes at the expense of Collignon. Granted, the actual things she does are mainly for laughs. Jeunet and co-writer Guillaume Laurent (A Saturday on Earth, The City of Lost Children) play these events off more as pranks. Collignon is never truly hurt, only his pride suffers. Still, in a film filled with so much charm, this sub-plot slightly mars the overall effect. One of the reasons Amelie works so well is because of Tautou. She gives an engaging performance, and Jeunet frequently focuses close-up on her face. Tautou is a young actress with an elfin face and perfect alabaster skin, round, expressive eyes and a cute pixie cut. She has a slightly crooked smile that embodies everything that her character is about. 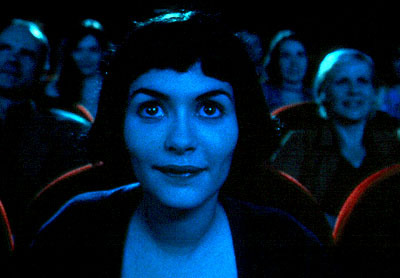 Amelie also enters the mind of the title character, bringing forth her fantasies for the audience to see. The animal pictures on her wall talk about her with sympathy, and she turns into water when Nino leaves the room. All of Jeunet and Laurent's characters are slightly off-kilter. These aren't typical 'movie' characters in that they are not conventionally beautiful or perfect, they are normal people with normal problems. It makes them stand out in Jeunet's fairy tale world, and it makes it easier to identify with them, and makes Amelie's efforts all the more meaningful. 1 hour, 20 minutes, French with English subtitles, Rated R for sexual content.